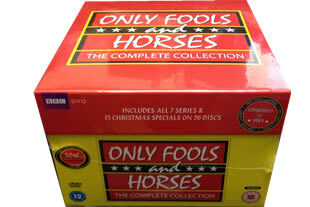 Only Fools and Horses DVD Complete Box Set. 26 DVD's and every series and special of the ever popular British sitcom. DELIVERED FREE IN THE UK. 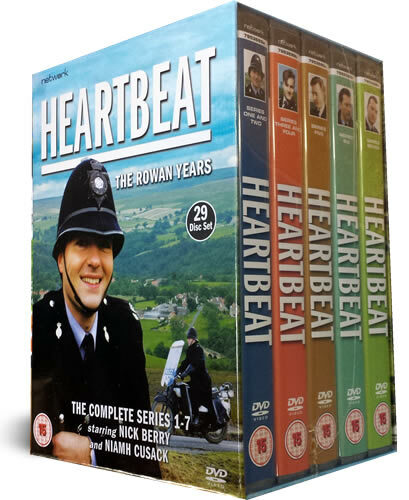 Here together in one collection is every episode plus the specials of Britain's best-loved comedy series. This hilarious, comedy series is one of the most popular on British television, and the annual Only Fools and Horses Christmas specials became as fundamental a British holiday tradition as Christmas crackers and the Queen's speech. Only Fools and Horses boasts 13 top comedy awards and is an all time classic! We are also working on a full episode guide which can be seen here if there are any episodes or scene that you are looking for. 26 DVD Box Set delivered to your door. Check our our review above. Absolutely brilliant. I have almost finished (for the first time) watching this great serries and Christmas specials. Keep up the good work, and prices at this site, the service and delivery, as I am in New Zealand, is really great. Cheers, Dennis Murray. Product arrived well packaged and as shown/advertised on site brand new to and not second hand It also came with a leaflet of other interesting boxsets you may want to buy.The price is unbeatable online for this price. Email response times are also highly professional in relation to any questions you may have. I would recommend buying from here. 5 stars. EXCELLENT DVDS, QUALITY IS VERY GOOD, DELIVERY EXCELLENT.ONLY FOOLS AND HORSES,WHAT CAN ONE SAY EPIC! Great product, real value for money. would recommend !!!!!!!! Obviously not watched yet, but the contents are excellent value for money. Only Fools and Horses is one of the best written and consistently funny sitcoms. I had forgotten how many gems there are here. Every episode seems to have a complete classic and hilarious moment or line and I am loving watching this set. I try to watch one per night and am now on to series 3. While my wife is shocked watching the news, I am laughing out loud daily because of this set and for the money it is such great value at the moment. I would recommend anyone who wants to cheer themselves up or laugh properly every day to buy this DVD set. It has every episode and all the Christmas specials right from the start to the end in a very nice quality card box set. As Del Boy says to Rodney and their 'father' in series 2 "most people get a present for Christmas, I get a wally with a disease!" This Product was a Xmas Present which was delivered on time , even though it was a last minute order. The product was very well packaged meaning when opened it was in perfect condition in an attractive box which housed a wonderful selection of DVDs displayed in series sequence and is now a pride of place feature in my son's bedroom. 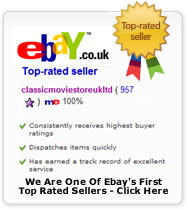 On the basis of my purchase I would highly recommend ClassicMovieStore and will definitely be using them again. The price is right. The comedy is priceless. At last my DVD's have arrived. Was a little concerned when they hadn't arrived almost 3 days after ordering but guess 2nd class mail at this time of year is extra slow. Hope my hubby likes his Only Fools & Horses dvd's. Classic Movie Store should perhaps think about charging that little bit extra for a more secure way of delivering items. Dvd's are great, very good value for money and arrived well packaged. very well packed and delivered fast thank you . highly recommended. Order not yet received, but have been very pleased with previous orders. Fools and Horses, this is good laugh, most likely as near as you can get to life in the real world. With an unbeatable price, and perfect delivery, what more can you ask for.